Today, the City will begin installation of Timed Free Parking Zones. The time limit in each zone will be either two hours or four hours. Areas that are designated as Timed Free Parking Zones have been determined in consultation with the local business community. 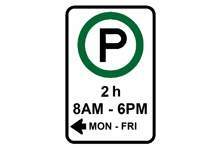 Former metered spaces will be equipped with signage to indicate to motorists that they are parking in a section with a time limit. All new signage will be posted during the coming weeks, see list below. In 2019 the city will purchase new meter hardware and technology to replace damaged or missing meters, as part of a five-year Paid Parking Management Strategy. The Timed Free Parking Zones are a short-term measure to encourage parking turnover in targeted areas.